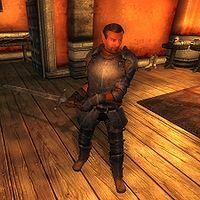 Brodras is a Bosmer crusader and an Associate of the Fighters Guild in Leyawiin. He offers basic training in Heavy Armor, but will only offer his services to members of the Fighters Guild. A wood elf that specializes in Heavy Armor is somewhat unusual, and Brodras knows it. It doesn’t bother him much, though, and he spends most of his time offering training while relaxing in the Leyawiin Guildhall. He sleeps in the southeastern bedroom on the ground floor and wakes up every morning at 6am. He starts the day in the east wing of the second floor with an exhaustive four-hour sparring session with fellow guildmember Antus Flonius. At 10am, he enters the west wing and relaxes for two hours. At noon, he heads downstairs and wanders around on the ground floor until he leaves the guildhall at 2pm. For the next two hours, he will take his lunch at the Five Claws Lodge while chatting with the regulars. At 4pm, he returns to the guildhall and spends two hours strolling around the ground floor. At 6pm, he takes a seat in the dining area and takes his time eating dinner. He keeps going for six full hours until he finally goes to bed at midnight. The exception to this schedule is during the Drunk and Disorderly quest, when The Five Claws Lodge is inhabited with drunken, restless Fighters Guild members. Once this quest is active, Brodras will skip his 2pm lunch and just stay in the guildhall. He will offer training at all times except when he is eating or sleeping. Brodras wields an iron claymore and wears iron boots, gauntlets, greaves and an iron cuirass. At night, he slips into a more comfortable set of Huntsman clothing: pants, vest and moccasins. He only carries a small amount of gold. Being a crusader, he knows the standard crusader and minor restoration spells. He also seems a little self-conscious about it, introducing himself with "Brodras of the Fighters Guild. I don't do contracts much. Mostly I'm a trainer. Heavy Armor. And look. No jokes about the Heavy Armor, eh? Not every Bosmer sneaks around with bows and arrows. I'm as tough and beefy as any Orc. Got it?" Lately his training is all that keeps him busy as he will tell you: "Blackwood Company's a problem. Not for me. I mostly do training. But we don't see many contracts in Leyawiin guildhall. Blackwood gets them all", although once the Fighters Guild questline is complete he becomes rather more optimistic: "Well, you sorted out the Blackwood boys, all right. Nice work. Now maybe we'll see a little more guild contract work here in Leyawiin." People in Leyawiin will be heard commenting on his skill by saying: "I've heard Brodras at the Fighters Guild is well-versed in using heavy armor, especially for a wood elf" and "Brodras has been teaching Fighters Guild members how to better use heavy armor. Odd for a Bosmer, but he's apparently good at it." Brodras is only supposed to eat dinner from 6pm to 9pm. However, because none of his other AI packages are active between 9pm and midnight, he keeps doing what he was already doing. Esta página foi modificada pela última vez à(s) 05h19min de 20 de outubro de 2015.